You may have discovered some of Ben & Jerry’s delicious ice cream flavors, but did you know that the co-founder of this incredible ice cream company likes Heath Bar Crunch ice cream best, or that he scooped ice cream in college? 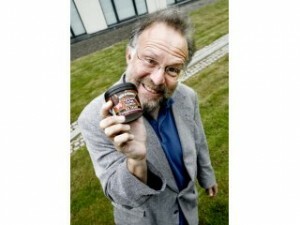 Find out more behind Jerry Greenfield, an amazing entrepreneur with a taste for good ice cream in our exclusive interview! AK: Why did you and your partner, Ben Cohen, decide to start, specifically, an ice cream company? JG: Ben and I always liked to eat. When we were thinking of starting up, we considered lots of different types of food. We picked ice cream because there was a revival in high-quality, homemade ice cream. Plus, we really like ice cream. Ben remembers his father eating ice cream directly out of a half-gallon container. Ben and a friend sold ice cream for several summers from an ice cream vending truck. I scooped ice cream at the cafeteria in college. AK: What inspired you to create a company which additionally gives back to the community? JG: We feel that business is a neighbor, just like any other neighbor in the community. Like any neighbor, it has a responsibility for the welfare of the community. Also, as the business started to grow, we came to understand the power that business has, and we wanted to use that as a force for good. AK: When you were in the process of starting Ben & Jerry’s, how common was it for companies to have commitments to their communities? JG: It was common for small companies. It was not common for larger ones, and I think Ben & Jerry’s helped play a role in getting businesses to engage in social responsibility. AK: What do you think sets Ben & Jerry’s apart from other ice cream companies today? JG: I think there are three things that set Ben & Jerry’s apart. The first is high quality ice cream, with lots of cream, not much air and all-natural ingredients. The second is the unusual flavors, which often have big chunks of cookies and candies, plus swirls as well. The third is the company’s commitment to a social mission, where the company measures its success not just by how much money it makes but also by giving back to the community. AK: What goes into the process of creating and choosing flavors for your ice cream? Do you have employees who are specifically hired to be Ben & Jerry’s Ice Cream “designers”? JG: There is a team of folks at Ben & Jerry’s who work on new flavors. They spend all their time working on coming up with new flavors and perfecting them. AK: What are some of the benefits and challenges to starting off as a small business owner? JG: There are many benefits of having your own business, the best of which is that you can do things any way you want, so the business can be a reflection of who you are as a person. The biggest challenge for us was that it was an incredible amount of really hard work, plus for the first several years, the business did not make any money. AK: Did you have any role models or mentors growing up, people you looked to for inspiration or advice? Did you have a mentor who helped you start your business? JG: My parents were mentors for me. My mother was the kindest person I have ever met. We had a couple of friends who gave us some advice before we started the business, and we received a lot of help along the way. AK: When do you think was the turning point for Ben & Jerry’s, from starting off as a small business to becoming a worldwide company? Describe what happened. JG: I think it was a pretty long process, and there wasn’t one particular turning point. What probably set us in the direction was the decision to start packaging our ice cream into pint containers for sale to grocery stores. We began as an ice cream parlor, and we were scooping ice cream to customers in the store. Because the winters in Vermont are so cold, business was really slow for much of the year. We needed to find a way to have the business survive, and so we began to package the ice cream. AK: What are your hopes for Ben & Jerry’s in the future, not only as an ice cream company but as a company committed to helping others? JG: I would hope that Ben & Jerry’s will become more committed to using its power and influence to help address global poverty. It has taken one step in that journey by committing to becoming 100% fair trade globally. Many of the ingredients in the ice cream, such as vanilla, coffee, cocoa, walnuts, bananas and almonds, are purchased from small farmers in developing countries. Buying fair trade guarantees a fair price for the farmers, who otherwise might get paid less for their products than it costs them to produce. AK: What would be some tips that you would give to kids who may someday wish to start a small business? Where should they go to get started planning for their business? JG: I would suggest starting small, and pick something that you are really passionate about. I think the best place to start would be to talk to people that have their own businesses, and ask them about their experiences. I find that people are usually more than happy to talk about their own experiences. I just want to say I love you ice cream………actually i’m abscessed with your icecream!!!! My favorite flavor is Chocolate fudge brownie! Never get enough chocolate right? Yeah and have have one question, what is your favorite book? Please email me the answer and if not just comment back right here! Thanks!